Here are some fun testimonials from our past wedding couples to help elaborate on what we do and why we love our work! Each wedding is unique, amazing, and important to us in every way, so we strive to do our best and make your wedding just that much more extraordinary. From the amazing moments when emotions fill the air to the last minute crunch time before the next event on your itinerary, we will be by your side every step of the way and ready to rock out! Below is a light read from a handful of many wedding testimonials from our many exciting adventures! Enjoy. Doug is absolutely phenomenal. We booked him for an engagement session in October 2014 as a test run for our wedding and he totally nailed it! Seriously, given the circumstances I we were in awe of the results. I could tell that Doug was cool and relaxed based on emails that we exchanged in the months leading up to the shoot. But the one thing I couldn’t have planned for was how excellent he is at improvising under pressure, because of course(!) the date that I chose months in advance was the rainiest, most terrible day in recent memory. I was really upset when I woke up and saw how awful it was outside. We ended up meeting with Doug near the Brooklyn Bridge and not only was he completely unfazed, he was totally prepared for the horrible weather and proceeded to take some of the most outstanding engagement photos I’ve ever seen. Which is even cooler considering that my wife and I are in them! Doug was a real trooper and was adamant about making sure that we were happy with our photos. And best of all, we had our pictures back in no time and they were awesome!! So fast forward to the wedding. As expected, Doug arrived right on time, this time with his partner Jason. They both looked sharp and were extremely professional throughout the day. Several guests were really pumped to finally meet the fantastic photographer that took our gorgeous engagement photos and luckily the weather was much more favorable this time around. All in all, they really did a spectacular job and I am so happy that we went with them for our special day! getting married? wanna take family pictures? wanna take pictures just for the heck of it? i totally recommend furious photographers!! doug and jason are like batman and robin. they are totally the dynamic duo! i was super nervous for our engagement shoot and didn’t know what to expect. however doug and jason just made me feel at ease during the shoot. i have trouble smiling with teeth for the longest time in pictures. and doug would make me laugh so that he’s able to capture those pictures that are most genuine. he’s super patient and willing to do what it takes to capture those wonderful shots! the funny thing is there was that anticipation of not knowing what the pictures will look like because as they tell you to stand somewhere or pose a certain way… often times i couldn’t help but be like this is weird. but trust them! the pictures turn out amazingly! totally makes me feel bad for even second guessing their creativity. they are good at what they do. so just roll with it!! they will meet with you. doug would recommend you to speak to a few photographers first so you’ll truly figure out what you like. they will show you their work. you can tell them what your wants and needs are and they’ll customize a package that works for you. they’ve been in the field for awhile now and they come with lots of tips even on the wedding day. my now hubby was missing a tie clip and doug let him borrow it all day. my wedding dress belt was too long and doug used his handy pocket knife and chopped it off for me. i wouldn’t know what i would do without them!! where else can you find life savers like that?!? only here! are you not from the LA or OC area? no problem! they’re willing to travel! super easy to work with. very friendly and makes you feel very comfortable. 2 thumbs up! i highly recommend them!!! I just got married this past weekend on July 4th. I will make this short and to the point. Doug and Jason took my engagement photos and my wedding photos. My experience throughout my history with Doug has been AMAZING. He is quick and knows how to direct people to pose in photos. My bridal party exact words were “WOW, we like him he is quick and knows what he is doing”! The minute Doug and Jason arrive to take our photos for our engagement and or wedding photos, they work with our timeline. Doug made me feel comfortable by making me laugh even though I have a hard time posing for photos. Doug also coordinated a photobooth for me and all my guests loved the backdrop and the ease of the set up. I did not want my wedding day to end and I am glad I had Doug from Furious Photographers to capture our big day. I HIGHLY recommend Furious Photographers to capture your event!!! I can’t thank Doug and Jason enough and can’t wait to see the photos! Doug and Jason are FANTASTIC! They not only take amazing photos, but respond to emails quickly, arrive on time and are super easy to work with. We wanted engagement and wedding photos that were unique and more magazine style, and these two definitely delivered. We came with some ideas for shots we wanted to take, and these two took our ideas to the next level. We’ve gotten so many compliments on both our engagement and wedding photos, and our wedding party LOVED working with them. Throughout our wedding planning and wedding day, these two were the only vendors we did not have to worry about. Thanks Doug and Jason! 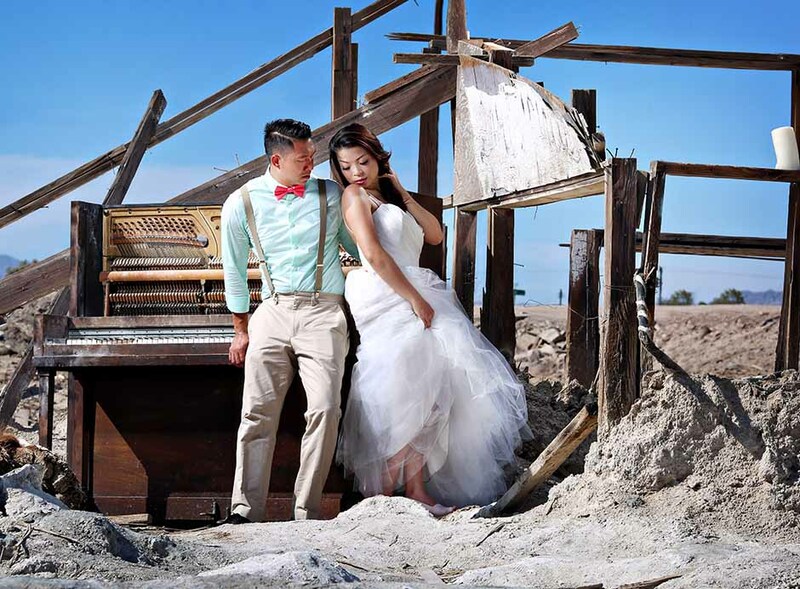 I want to take a wedding pictures in LA and I searched a lot of photographers in LA areas before I chose Dough. His work attracted me most, so I called him. It turns out to be the wisest choice I’ve made. I have to say he 100% met my expectations. I’m very picky on the pictures. And I sent him some sample pictures and styles I want before the shooting, he is very easy to communicate and willing to take my advice. Also we have two places to shot, it took 2.5h to get to second place due to heavy traffic that day. But he is always very patient, never complained. We started shooting from 12pm and finished by 8ish pm. It was very late, but he was still very willing to take more pictures for us. However, my husband is too hungry to continue shooting. So we stopped. The only regret was we do not have enough time to shoot all the nice spots we want. Also, several of my girlfriends asked for his contact information after seeing my pictures. So if we want to take pictures again, I’ll come back to him. He is one of the few best in LA!!! We knew for our wedding we wanted the best photographers we could find while being on a budget. We decided to go with Furious Photographers since we knew Doug and his amazing work ahead of time. Coordinating with them via email was always smooth and easy. Doug was extremely responsive throughout the whole process. Doug and Danny flew out to NY and joined us for our special day. Having both of them there allowed them to be able to split up in the morning to take pictures of both groom and bride getting ready. Doug and Danny are extremely professional and incredible understanding with all the wedding craziness. They captured amazing shots during the ceremony and we had a great time taking pictures before the reception. It was extremely comfortable working with them since we really trusted them with their tips and suggest poses. The highlight was seeing the digital pictures and how amazing they all came out. Putting together the finished album was also easy since we could review the layout, provide comments, and it was an open conversation throughout the process. We are extremely pleased with our wedding album- from the binding, thickness of pages, color of the print, and of course all the amazing pictures. I highly recommend Furious Photographers for your future engagements- they truly capture the special moments! My husband actually found furious photographers online and decided they were “the ones” after looking at their amazing photos and different look to their photography. We really loved their style and how they made the photos look like art, so unique!! Doug and Danny were the main and assistant to our wedding and are awesome photographers! We had the pleasure of having them do our engagement photos and also wedding photos. During our engagement session, I liked how they didn’t rush us and let us just go around and take our time. I liked how they helped us to take some really cute photos in random areas of the amusement park as well! Very creative and the photos came out lovely! I especially like how sometimes they would help us with poses that we wouldn’t have thought of ourselves, and they were really fun to work with! They were also very patient and also made sure we got all the photos we wanted, and we had a nice day with them getting to know them! I really appreciated how Doug was very easy going and pleasant to work with and went above and beyond my expectations. Doug worked with us to be available to help us take some extra photos to set up as portraits when we didn’t feel we had any from the engagement session to use, and he even printed them for us! I thought that was very thoughtful of him, because he is busy and didn’t have to do that! On our wedding day, he not only was our photographer but also was like my personal wedding assistant! He was especially helpful in bustling my dress and also half way through my wedding it started coming loose and he lent a hand again! Our photobook came out great too and all of the pictures were stunning. I liked how their photos aren’t all just your average posed photos, but “in the moment” and looked spectacular! I also really liked Danny’s photos, how he captured certain moments and aspects that Doug might not have as he was pretty busy snapping away! I also thought he had a great eye for photos. All in all, I can’t imagine having anyone else…they were great to work with, photos came out great, and I thought they made a great team! Doug also was amazing and printed out a photo canvas for us free of charge! MUCH LOVE to Furious Photographers!! My wife and I spent a few weeks researching photographers online, and the first website portfolio we truly loved was Furious Photographers. Doing the responsible thing, we interviewed a total of four photogs, two we found online, and two were recommended by our planner, and all were very talented. When we met with Doug, his great personality and cool style — in addition to his incredible work — felt like the perfect fit for our wedding. We felt pretty sure about choosing him until he told us the story of how he got in to photography…that sealed the deal. In addition to being a very talented artist, it was evident that he was a great person, and someone we definitely wanted to be a part of our big day. Once we agreed to terms, we set a date to do our engagement shoot. My wife was very nervous as she didn’t know what to expect, but Doug was a consummate professional. He made us both very comfortable and spent a few hours walking all around Santa Monica with us. It was a fun day, and he did a fantastic job of capturing the moments. He exceeded all expectations, as the pictures he shot made us look so much cooler than we are in real life. He is truly gifted. When it came to the big day, my wife and I had fortunately hired great vendors across the board, but Doug and Danny stood out. They arrived early, dressed to code, and worked every moment that they were there. Their previous experience was invaluable as they were prepared for every situation. Even when I forgot my tie and had to run to the mall to buy another one, Danny asked to tag along to capture the moment. The highlight of the night (aside from the wedding) was shortly after dessert when Doug surprisingly put together a slide show of the images he captured throughout the day and presented them on a flat screen TV to all of our friends and family. We sat in awe as we watched the incredible shots that were captured, and were truly taken aback by how thoughtful Doug was to do that for us (unplanned, and never discussed). I have and will continue to recommend Doug and Furious Photographers for weddings or any other sort of event that you want captured. He is an incredibly talented artist who has a unique and contemporary style. Our friends and family still compliment us on how great our wedding photos turned out. That is all thanks to Doug. I LOVE FURIOUS PHOTOGRAPHERS! Their professionalism, creativity, quality, and efficiency make Doug and his team STUPENDOUS. Doug and Danny took our engagement pictures in Los Angeles and being that I hadn’t been drinking (as it was only 11am) and it was my first time at a professional photo shoot, I was pretty nervous. I wanted our pictures to come out great and I trusted FP since I saw photos of their past sessions. I was just concerned that my nervousness would show on my face during all the pictures. Doug and Danny definitely kept me at ease and made sure my husband and I were comfortable. I started out feeling really awkward but after running around the city with these guys, our photo shoot became an outdoor adventure! The pictures looked AMAZING! All the colors and the images looked brilliant. I loved it. Plus we got to see the pictures within the next day. THESE GUYS WORK FAST! Furious Photographers also photographed our wedding, but this time it was Doug and Muriel. I have no idea how much editing they did but the pictures looked PERFECT. When I compared the teal color of my bridesmaids dresses, groomsmen vests, ties, and paper lanterns that I used for the aisle décor at our ceremony, they were close but didn’t match in real life as well as I had hoped but I used them anyways. In the pictures, the colors were all SPOT ON, looking exactly how I hoped they would! I was so excited and impressed! They caught all the best moments of that evening and I was able to relive it within a few days after the wedding when I got see all of my fabulous photos! Thanks Furious Photographers! I will definitely be recommending him and his team to all my friends and fam. Furious Photograhers receive my highest possible recommendation for engagement and wedding photography. My wife and I did our engagement session and wedding photography with them and are still showing our pictures off and having people comment on them two years later. Absolutely professional, fun and easy to work with, and extremely talented. Doug and Danny have the gift. I discovered them when I was looking for pictures of the venue that my wife and I were planning on having the reception at. There were a few pictures that really stood out from all the randomness that google provides in an image search. When I clicked on the pictures I discovered their site, and literally spent an hour and a half just looking at all of the awesome pictures they had. It was exactly the style and feel that my wife wanted in an engagement session, let alone for a wedding photographer. I contacted them and instantly received a response from Doug. We discussed where we lived (San Diego) and what kind of a shoot we were looking to do. He set the whole thing up and worked around what were very busy schedules (dual military). We met both Doug and Danny near the USS MIDWAY Museum in San Diego and have to say, the feeling was very comfortable right from the start. For someone who has never really done a photo shoot, being able to be comfortable and not feel awkward posing for pictures is a huge plus. Even though the session was only scheduled for a few hours, Doug and Danny were so committed to getting the job done righht that it never felt like it was on the clock and they went WAY over the allotted time. We had an online album to share with people very quickly and we were absolutely blown away. We shared the link and people couldn’t believe that we were the ones in the photos because they looked like they belonged in a magazine. We immediately booked Doug and Danny for our wedding in San Diego. They took amazing photographs and captured some perfect moments that my wife and I will forever cherish. I cannot say enough good things about them. They are the best, most professional team I have ever seen, and my wife still talk about how happy we are with the photography. There aren’t enough stars on this rating for them. Shoot us an email and tell us your story! We love to hear how everyone’s story from how you met to the details of the proposal! Keep track of us on our latest wedding adventures on our blog, but do drop on by our Wedding Gallery here!